Home / Insights/ Reporting / How do I create and export project reports? Use the filters available to narrow down your search, or export everything from the start of your project. 2. On the right side, select the pod you want all of the information from and specify your date range. Date: Specify a period of time. Available terms are- Last 7 Days, Last Two Weeks, Last Month, This Month, and Custom Date Range. Show: Choose from Milestones, Tasks and Time or select all of them to export. For example, check only Tasks to export just tasks. 3. 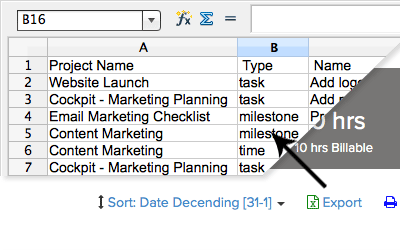 On the left side, you can choose further task filters or arrange by date. Current Status: All of the current status options available for tasks. Task Type: Any custom or default task type that you can associate to a task. Date: Change between ascending and descending dates. 3. Click Get Pod Insights on the right side to view your report before exporting. 4. Click Export to start downloading a .CSV file, or Print to create a .PDF. You can open the .CSV file with any spreadsheet software such as Microsoft Excel, Open Office Calc, or Google Spreadsheets. The report will be different based on any of the filters that you used. How do I get a report on someone’s workload? On Insights, which date does the date filter represent? How can I see a list of tasks that have been completed? Can I filter my reports by group?